There are at least two potential non-decorative consumer uses for lasers outdoors, pointing out stars in the sky and dispersing birds. This page discusses star-pointing with lasers. Using a laser for star-pointing needs to be done with caution. It is an application that requires relatively strong lasers, so that viewers can see the beam shaft (not just the end dot). Further, the beam is aimed at glowing objects in the sky. Because these glowing, point-like objects could be aircraft, outdoor laser users need to be careful. Aircraft at a distance can look like stars. This is especially true if they are moving directly towards you, since there will be little apparent motion against the sky. For this reason, NEVER point directly at a dim or unknown “star”. Instead, move the beam in a circular motion around the object. When doing the circular motion, or when “drawing out” a constellation, keep the beam moving and keep it away from any “stars” since they may be aircraft. The beam does NOT end! This unretouched photo shows how a beam outdoors can seem to end after only a few hundred meters. This is a potentially dangerous illusion, as described here. The beam actually continues to travel -- even though the viewer can no longer see the light scattered back to them. In Feb. 2011, a 14-year-old boy was arrested for illuminating an aircraft on approach to Los Angeles International Airport. He told police that he thought the beam “would not go up to the height of the aircraft.” He was wrong, of course. Instead of a few hundred feet, a beam can be a hazard to pilots miles away. For example, even a relatively weak U.S.-legal 5 mW laser pointer is a distraction hazard to pilots over two miles away. The more powerful beam in the photo can cause serious glare (the pilot can’t see past the light) two miles away, while the distraction hazard is 22 miles! Therefore, ALWAYS act as if the beam continues on, forever. Don’t let the beam get close to any aircraft or unknown star along either the visible beam path OR its non-visible continuation. For star pointing, green is best. The human eye sees green much better than the same amount of red or blue, so a 5mW green laser appears to be 5 to 10 times brighter than a 5mW red laser. Looking at a green beam in the sky should not adversely affect night vision. To keep your night vision, avoid looking directly at the laser dot on a nearby or light-colored surface. In some jurisdictions, there are limits on laser power. For example, in the U.K. it is not allowed to sell laser pointers over 1 mW. In the U.S. it is not permitted to sell lasers for pointing applications over 5 mW. You may be restricted, therefore, in the laser pointers which are available to you. For yourself or a small group under most conditions, 5 mW is sufficient. For a larger group, or where the air is especially clean and dry, slightly higher power such as 10 to 25 mW will be better. The absolute limit for this application should be about 50 mW. There is no objective reason to need more than 50 mW for astronomical pointing applications. 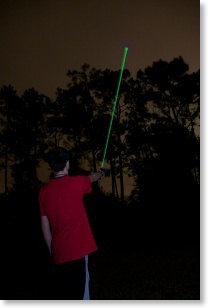 The Royal Astronomical Society of Canada has produced a webpage with information and recommendations on green laser pointer usage. At the bottom of the RASC webpage are additional resources such as a brochure, poster and PowerPoint presentation.